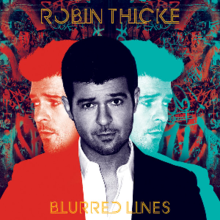 I have fallen in love with the song “Blurred Lines” by Robin Thicke. Yes, I’m aware that it’s on the radio ALL the time – in fact, sometimes you can even change the channel and it’s on like all of the pop stations. But it’s catchy and I like it. I am a believer in buying the whole album, not just a single. Some of my favorite songs have never seen the light of day via radio DJ, but were recorded. I bought this whole album (also called Blurred Lines) and was actually disappointed. Part of what I really loved about Robin Thicke was his strong R&B roots. On this album, he’s completely crossed over to a highly mixed, far less R&B sound. To be honest, I’m not loving it at all. This might be one of the few times that I recommend just buying the one catchy single and passing on the album!